Paella is a one-pot dish made from rice and either seafood and/or meat from Valencia, on the east coast of Spain. It is traditionally flavored with saffron. It's one of my favorite meals on a winter night. And it's a great way to get some nutritious seafood into your family. I adapted this recipe from Cook's Illustrated. For this recipe, you don't need the giant paella pan. 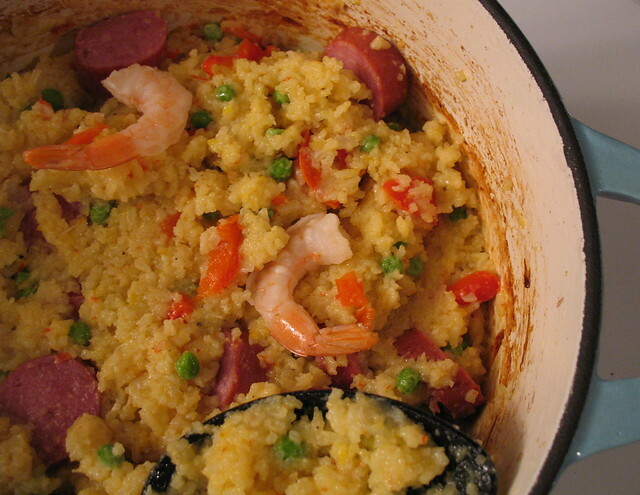 You can make paella in a Dutch oven (the Dutch oven should be at least a 6-quart capacity). Dry-cured Spanish chorizo is the sausage of choice for paella, but fresh chorizo or linguiça is an acceptable substitute. If you can't find any of those, use a spicy Italian sausage. If you buy sprouted rice (or germinate your own rice at home) you do not need to soak the rice. You can find sprouted rice on my resources page. 1. Warm 1 cup of the filtered water in a small saucepan to about body temperature (warm to touch, but not hot). 2. Add the brown rice and the warm water, plus 1 tablespoon of whey, yogurt, kefir or buttermilk to a glass or enamelware bowl or mason jar. 3. Cover and let soak for 8-24 hours in a warm place. 4. Peel and devein the shrimp. (Devein means pull out the black thing on the back of the shrimp — do not skip this step). Remove the peas from the freezer and allow to defrost. 5. Adjust oven rack to lower-middle position; heat oven to 350 degrees. 6. Peel garlic cloves and finely mince. Toss shrimp, 1/4 teaspoon sea salt, 1/4 teaspoon black pepper, 1 tablespoon olive oil, and one teaspoon of minced garlic together in a medium bowl. Cover with plastic wrap and refrigerate until needed. 7. Season the chicken thighs with sea salt and black pepper. Set aside. 8. Heat 2 teaspoons of olive oil in large stock pot or Dutch oven over medium-high heat. Remove seeds from the bell pepper and slice into strips. Add peppers and cook, stirring occasionally, until skin begins to blister and turn spotty black, about 3 to 4 minutes. Transfer peppers to a small plate and set aside. browned, about 3 minutes. Turn pieces and brown on other side, about 3 minutes longer. Transfer chicken to a medium bowl. 11. Slice the sausage into 1/2 inch pieces, on the bias. 12. Add the sausage to the pot, stirring frequently, until deeply browned, about 4 to 5 minutes. 13. Transfer sausage to the bowl with the chicken. 15. Peel and dice the onion. Add the onion to the pot and cook, stirring frequently, until softened, about 3 minutes. 16. Stir in the remaining garlic and cook until fragrant, about 1 minute. 17. Drain the can of tomatoes well. Add to the pot and cook until mixture begins to darken and thicken slightly, about 3 minutes. 18. Strain the rice and rinse. Stir in the rice and cook until grains are well coated with tomato mixture, 1 to 2 minutes. Stir in the chicken stock, white wine,saffron, bay leaf, and 1/2 teaspoon of sea salt. 19. Return chicken and sausage to the pot and transfer to the oven. Cook until rice absorbs almost all the liquid, about 15 minutes. Remove pot from oven. Uncover, and scatter shrimp over rice. 21. Insert mussels, hinged side down into rice (so they stand upright), arrange bell pepper strips in a pinwheel pattern, and scatter peas over top. Cover and return to oven. Cook until shrimp are opaque and mussels have opened, 10 to 12 minutes. 22. Let paella stand, covered, for 5 minutes. Discard any mussels that have not opened and bay leaf. 23. Roughly chop the parsley and sprinkle over the paella. I feel like I am missing a step with the rice. You explain how to soak it in steps 1-3, but then in step 18 you just say to stir it and cook it in the tomato mixture. What do you do with the rice after it’s soaked, do you drain and rinse or not rinse, do you mean to say that you add the rice to the pot and saute the rice and then add the broth to cook it? Sorry, it sounds good, I just want to understand how to work the rice. Thanks! Looks incredible. I LOVE paella! Can’t wait to try this once I place an order for wild shrimp and mussels. Okay, so I was totally excited to make this because I found that I had nearly all the ingredients on hand (unusual occurrence for me). However, my pot has been in the oven for over 15 minutes and it does not look as if the rice is absorbing the liquid. The rice I bought was Sprouted brown GABA rice, so I didn’t do any of the soaking steps because I interpreted it as that I didn’t need to if the rice was already sprouted. I checked the rice package and it gives a cooking time of 25-30 minutes. I imagine this would work with your cook times given that you continue to cook the Paella after you added the seafood. I’m going to go ahead and toss in the shrimp (no mussels, sadly) and see what happens. Also, I diced up 14 oz. of fresh tomatoes since I tend to not buy canned foods. Is this acceptable or would that add to much liquid even if I de-seed them? Thank you for the great recipe. I can only hope mine turns out well. I made this last night and it was delicious. If you are using unsoaked brown rice it will take 45 minutes in the oven for the rice to absorb the liquid. What a thought… two Jennifers making the same dish on the same night! Yes, you are correct about the cook time. After I posted my comment I checked on my paella and found that the rice had swelled and most, if not all, the water was absorbed. I tossed in the shrimp, peas and peppers and left to cook just until the shrimp were done. When I opened the pot I thought surely this can’t be something that *I* made because it looked and smelled amazing. And the taste? Well, all I can say is that I wish I could make it every night! It was superb!! And really, the dish was simple to make – it was just the prep that was a little daunting (shelling and de-veining was more work than I initially thought). Looking forward to leftovers tonight!